In 2009, the Texas Legislature recognized the significance of the state’s earliest paved roadways by establishing the Texas Historic Roads and Highways Program. 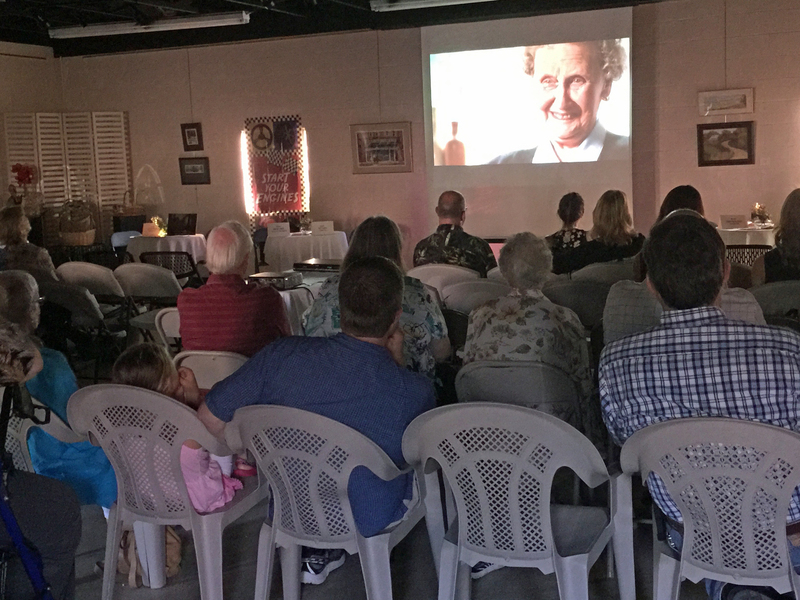 To develop the untapped heritage tourism potential of these roads, the Heritage Tourism Program selected three cities along the route of the Historic Bankhead Highway—Big Spring, Weatherford, and Mount Vernon—in which to conduct a pilot series of heritage tourism product development workshops in 2015. The workshops brought together city representatives, cultural leaders, business owners, and other community stakeholders to create a variety of new tours, exhibits, films, festivals, classic car rallies, and cultural demonstrations in celebration of their shared Bankhead Highway legacy. Citizens of Mount Vernon created several new Bankhead Highway tourism products during the workshop series. 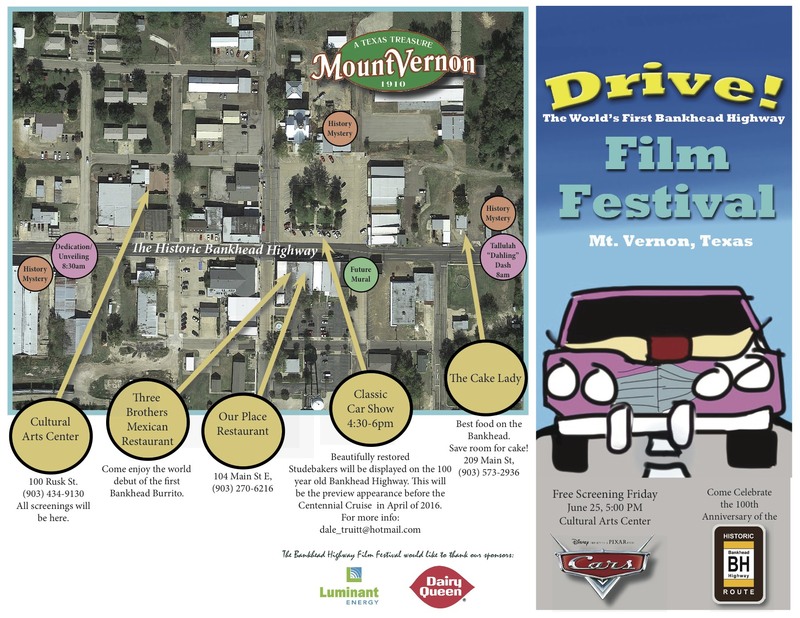 DRIVE!, is an annual Bankhead film competition and festival organized by the Franklin County Arts Alliance and Mount Vernon Main Street Program. The festival is multi-day, with events held in several Mount Vernon downtown venues—along or near the Bankhead corridor—including the Franklin County Arts Alliance, the Teague Chevrolet building, Smoky Row (a local nickname for a section of downtown just off the highway), and Franklin County Courthouse Square. The film competition aims to attract submissions that focus on topics related to Bankhead Highway and auto travel history, and includes the screening of finalists’ work as well as a selection of loosely related Bankhead-themed feature films and regionally produced art films. Festival events—which include antique car rallies, Bankhead themed 5K runs, and other events—will attract a wide array of audiences both local and statewide. The History Mystery Panels, an idea encouraged for statewide replication in other interested Bankhead communities, took advantage of the Franklin County Historical Association’s extensive historic image archive and the community’s collective memory of town history. Focusing on the auto related architectural legacy of the Bankhead period that survives in towns across Texas, several remarkable historic structures in Mount Vernon were selected to feature panels. Mount Vernon workshop participants produced a series of large historic photographic murals that enliven empty storefronts and blind walls while visually illustrating the importance and relevance of Bankhead history for Mount Vernon residents and visitors. The photographic murals also contain a challenging question—or “mystery”—which compels viewers to look closely at the photographs and then compare the image to the surrounding present day downtown. Viewers learn from changes they observe and sharpen their skills for reading the Bankhead cultural landscape, while deepening their appreciation of how the highway impacted local history. The history mystery panels in Mount Vernon are linked to a video produced by the Franklin County Historical Association by way of a QR code that viewers may scan with their smart phones. The videos further elaborate the historic image presented on the panel and provide deeper insight into the history of Mount Vernon. The panels also direct visitors to downtown businesses that install the Bankhead Highway blaze in storefront windows, as these participating businesses hold the printed answer key to the mysteries presented on the panels. View the gallery below to learn more about the Bankhead Highway Heritage Tourism Development Workshops held in Mount Vernon. 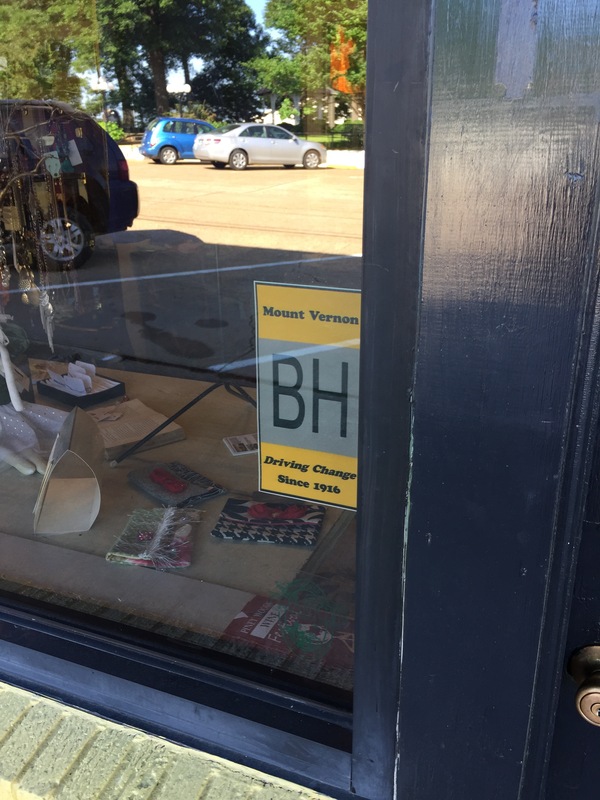 Bankhead Highway signs in downtown storefront indicate businesses participating in the History Mystery challenge.